Have a custom idea? A problem that needs a solution? A challenging set-up? We can help! We’ve created some of the most innovative dispensing solutions in the industry - and many of those began as a custom collaboration with a client. We’re always up for a good challenge - and we love helping customers turn problems into profits! See below for just a sample of what we can do - then contact us today at 310-532-4444 and let’s talk about your ideas. When a Major League Baseball stadium came to us and wanted to serve 4 cocktails, 2 frozen cocktails, and 2 wines on tap in an outdoor area, we decided to swing for the fences and build a portable dispenser that not only looked great, but could be locked and secured when not in use. To complicate matters, the area was under construction and would not have a roof for several months, so it needed to be weather-proof. We designed a custom solution that met all of these needs in one nice, neat package on heavy duty caster wheels. The two cabinets lock together for a total of 12 faucets and 2 frozen beverage machines. Other features include shelves to hold cups, speed racks for cups and add-a-shot bottles, and dry-erase flavor signs above each faucet for labeling drinks. 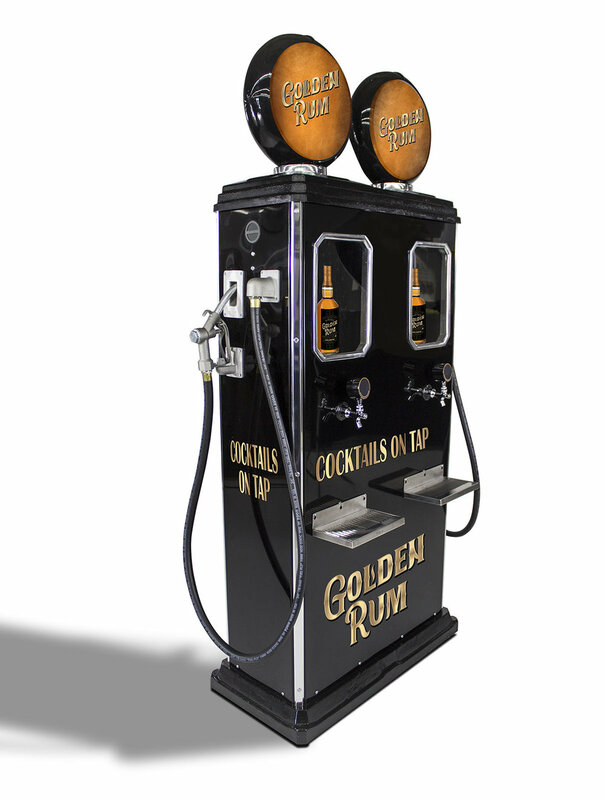 When a client asked us to build a custom dispenser that had all the style and attitude of their brand, we got to work and came up with this cocktail-on-tap floor model gas pump that screams fast cars and rock and roll. It includes a built-in MP3 player, back-lit globe, lighted bottle display and dual-flavored dispenser. The countertop model offers a more space-efficient alternative - and both deliver a one-two punch of stop-you-in-your-tracks style and ring-up-the-sales effectiveness.